Thermal fogging is the generation of ultra-fine droplets in a range of 1-50 ?m using thermo-pneumatic energy. Liquid substances are vaporized in the unit and form ultra-fine aerosols by condensing on contact with cool ambient air. Thermal fogging is used for any pest control task where active substances should be uniformly distributed even in inaccessible places, without leaving undesirable residues. 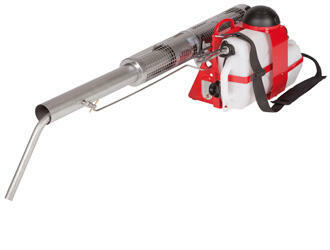 The fogging technique is the solution for treating large areas and spaces with a minimum quantity of pesticide solution, less operational work and with little harm to the environment (lessresidues, no penetration into the ground), e.g. in the field of public health, stock protection, plant protection, disinfection, decontamination, deodorization and cinema effects. The K-10-SP is registered at WHO (World Health Organization). 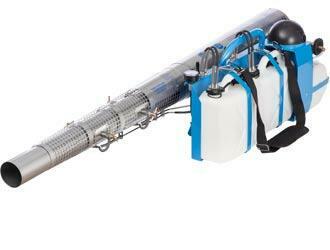 The pulsFOG K-10-SP-SAN is a special construction for the sanitary sector: A bent fogging pipe simplifies the treatment of underground sewage-systems via the access gullies or the ventilation openings in the street. 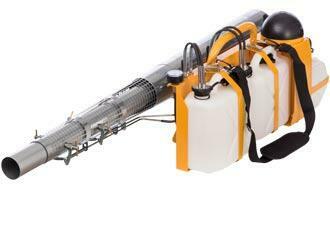 The pesticide-fog is carried over several hundred meters within the sewage-system due to the constantly existing airblast; thus controlling disease-causing organisms, vectors and other pests effectively. The bent fogging pipe is exchangeable with a straight fogging tube. 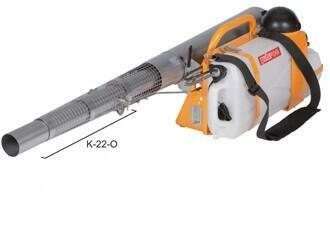 The pulsFOG K-10-SP-ANTEATER is a special construction for the control of pests in the soil e.g. 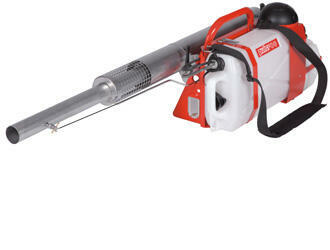 termites and leaf-cutting ants, provided registered liquid pesticides are applied. Ants and even mice in the soil are successfully controlled with the active ingredients permethrine and chlorpyrifos. These two special applications demand for adjusting the fogging performance and therefore, the fogging performance of a pulsFOG K-10-SP-SAN or ANTEATER is not to be compared with a standardized K-10-SP with 17,5 kW. This special construction of the K-10-SP-SAN or ANTEATER (and special adaptation for straight/ fogging) reduces the fogging performance to 8,75 kW. Thermal fogging is the generation of ultra-fine droplets in a range of 1-50 µm using thermo-pneumatic energy. Liquid substances are vaporized in the unit and form ultra-fine aerosols by condensing on contact with cool ambient air. Thermal fogging is used for any pest control task where active substances should be uniformly distributed even in inaccessible places, without leaving undesirable residues. The fogging technique is the solution for treating large areas and spaces with a minimum quantity of pesticide solution, less operational work and with little harm to the environment (lessresidues, no penetration into the ground), e.g. in the field of public health, stock protection, plant protection, disinfection, decontamination, deodorization and cinema effects. The K-10-SP is registered at WHO (World Health Organization). 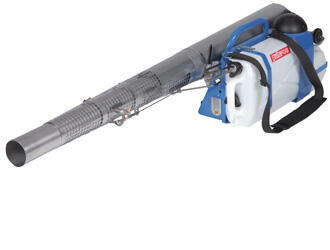 Standard-units are designed to fog waterbased, non-flammable fogging solutions and suspensions. Thermal fogging is the generation of ultra-fine droplets in a range of 1-50 ?m using thermo-pneumatic energy. Liquid substances are vaporized in the unit and form ultra-fine aerosols by condensing on contact with cool ambient air. Thermal fogging is used for any pest control task where active substances should be uniformly distributed even in inaccessible places, without leaving undesirable residues. The fogging technique is the solution for treating large areas and spaces with a minimum quantity of pesticide solution, less operational work and with little harm to the environment (lessresidues, no penetration into the ground), e.g. in the field of public health, stock protection, plant protection, disinfection, decontamination, deodorization and cinema effects. 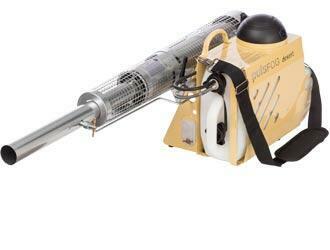 O-units are designed to fog inflammable and non-flammable fogging solutions but not suspensions. a) The successful application of heat sensitive biological ingredients (Bacillus thuringiensis, Juvenile hormones, Beauveria bassiana) and other chemical substances. Thermal fogging is the generation of ultra-fine droplets in a range of 1-50 µm using thermo-pneumatic energy. Liquid substances are vaporized in the unit and form ultra-fine aerosols by condensing on contact with cool ambient air. Thermal fogging is used for any pest control task where active substances should be uniformly distributed even in inaccessible places, without leaving undesirable residues. 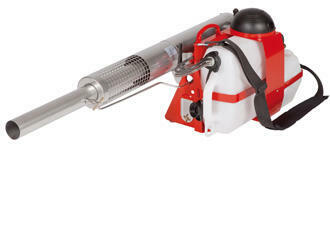 The fogging technique is the solution for treating large areas and spaces with a minimum quantity of pesticide solution, less operational work and with little harm to the environment (less residues, no penetration into the ground), e.g. in the field of publichealth, stock protection, plant protection, disinfection, decontamination, deodorization and cinema effects.